I have a theory I bore people with at dinner parties called the "Googly Eye Effect". It scientifically states that if you stick googly craft eyes on any inanimate object, it is immediately rendered adorable. It works especially well with food. Unfortunately, during the course of writing this article, I realised I'm not as original as I thought – Japan has been anthropomorphising food for centuries (in other words, assigning human attributes to things that are decidedly non-human). Back in 1450, a comic-like piece of art known as Shojin Gyorui Monogatari depicted a mighty battle between opposing armies of seafood and vegetables, while Japanese artist Utagawa Hirokage is best known for his 1859 triptych of The Great Battle between the Fruits and Vegetables and the Fish. Fast-forward to the '70s and comic-book hero Anpanman is wearing a cape, fighting evil and never going stale (he's a red bean-filled bread roll with a television show and a movie under his little yellow belt). There's also Nameko, the phallic-looking mushroom-slash-videogame star; the white Nyan Nyan Nyanko kittens that are usually wedged into something edible and Gudetama, the lazy egg yolk. The latter was the runner up in a contest hosted by the Hello Kitty company to find new characters based on food. Believe it or not, a salmon head with a tiny body called Kirimi-chan took out first place. 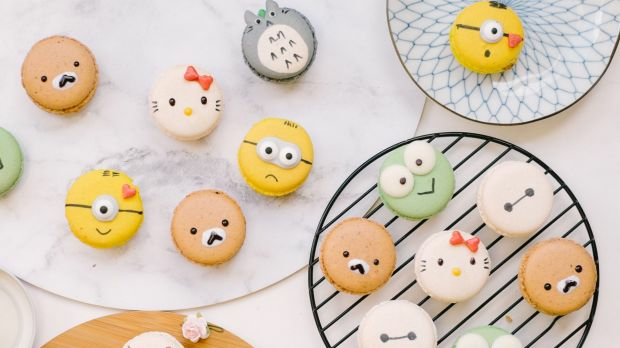 Although kawaii food (kawaii is "cute" in Japanese) has been around for centuries, it's only invaded Australia over the past year via social media. These days it takes more than another freakshake garnished with a cruffin to command our attention; the #foodporn bar has been drastically raised, and kawaii baked goods are the answer. 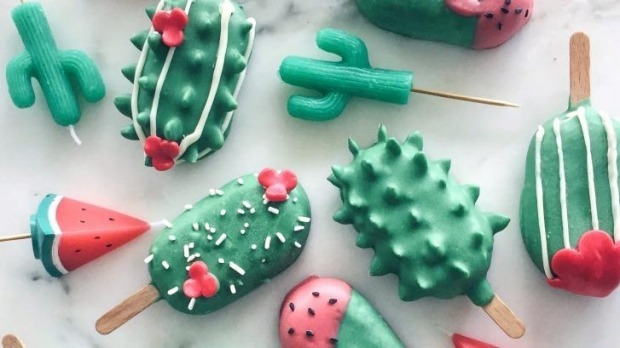 A community of Aussie kawaii bakers exists online. Most are in Sydney and self-taught, crafting character cakes and cat doughnuts as an escape from study or number-crunching careers. Vickie Liu (@vickiee_yo) is based in Melbourne and has nearly 160,000 people around the world salivating over pastel images of panda doughnuts and adorable biscuits. "I was studying my undergrad in architecture and I didn't like it, so I did another course, interior design. I didn't really start baking regularly until after I graduated from my first undergrad course – it was an outlet," she says. Last year before a trip to Europe, Liu baked biscuits shaped like famous landmarks and Instagrammed them during her travels. The series featured London's Big Ben, the Eiffel Tower, a canal-side house in Amsterdam, a Leo Messi jersey at Camp Nou football stadium in Barcelona and the Arc de Triomphe – which broke and had to be held in place for the photo shoot. Liu is currently taking a break to recover from baking burnout and experiment with new designs. She plans to wholesale later in the year. "I really like making the Totoro doughnuts, but they're everywhere now; everyone has their own version of them," she says. Erina Akiyama (@eliseaki) is one Instagrammer with a version of Totoro doughnuts, but she also ventures into Pokemon, Minions, Winnie the Pooh and more. She's a trained chef who works at Sokyo in Sydney, but an amateur baker. She only moved to the pastry section at the restaurant in March after nurturing her love of sweets online. "I'm a farmer girl, so we grew up with strawberries and rice and stuff and I used to do all the baking and cooking at home. I'm Japanese and I like all the animations and I love Disney," says Akiyama, who used to visit Disneyland monthly in high school. Kawaii food fans should add Disneyland Tokyo to their bucket lists. You won't find green ice-cream mochi Aliens from Toy Story anywhere else. Crystal Lotus restaurant at Disneyland Hong Kong is another option. 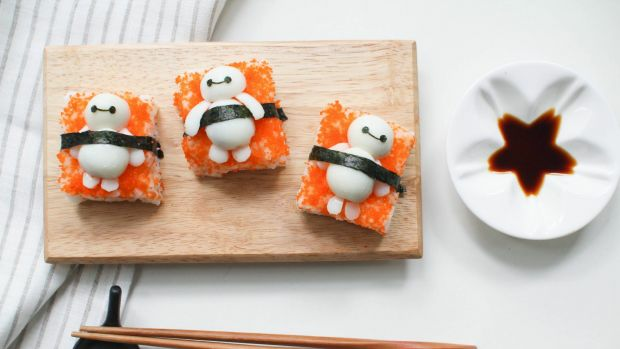 Here you can feast on dumplings shaped like Olaf the snowman, Baymax, Chicken Little and Mike Wazowski (if you don't know those characters, you have some DVDs to watch). Most Aussie kawaii bakers cite Singapore-based Li Ming as an inspiration and it's easy to see why when you look at her @bentomonsters feed. From Gudetama puddings and Miffy bread to cat sushi and Rilakkuma bear pancakes, each takes between five minutes to an hour to assemble excluding cooking time – longer if she's collaborating with major kitchen appliance and food companies, or even Disney. I couldn't help but wonder if her two boys, ages nine and 12, know how lucky they are. "They have been eating cute food for so long, they are quite nonchalant about it compared to the initial excitement! It's now more of a hobby for me," she says. "They do still like to guess what I'm making and if it's a character they like, they will play with the food a little before eating." Ming has her boys to thank for her 200,000+ Instagram audience and new cookbook, Yummy Kawaii Bento: Preparing Adorable Meals for Adorable Kids. It all started when her oldest began primary school in 2011 and she'd pack charabens (short for character bentos) with little notes so he'd look forward to the day. Papers have been written on Japanese charabens that weigh up the gendered role of preparing them against personal satisfaction and public recognition (see Women & Performance: a journal of feminist theory). In Ming's case, she stopped sharing the bentos on her personal Facebook account when friends felt pressured to match her standards. She turned to scrapbooking, and when the scrapbook filled up, to blogging. Instagram came later and is now a major part of documenting her creations. Although cooking for someone you love is nothing new in the Western world, the Japanese food niche of kawaii baked goods certainly is. Down Under, we're a fresh market and the perfect example of just how creative you need to be to get noticed on food-saturated social media. But regardless of where they are in the world, the key to success for kawaii cooks is the same: share what you love and fans will follow. Or maybe it's just the Googly Eye Effect. 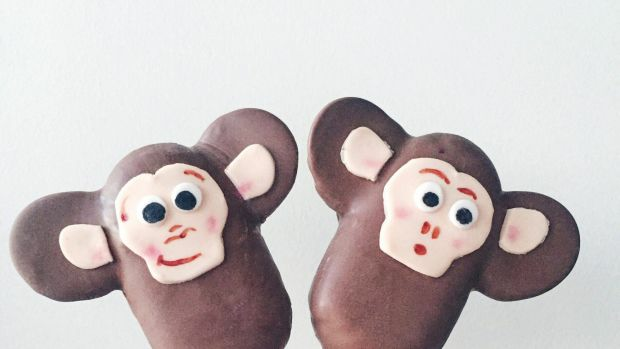 On why people care about kawaii treats On Instagram there are so many people who bake. Most people can make macarons and bread now, so people are just trying to bring it up a notch and really have fun with it. On her big break I'm originally from Indonesia. When I moved to Australia with my husband it was hard to get a job so I started baking to kill time. In December I started making this cute stuff and I put it on my Instagram, but I knew people didn't know about it so I gave some to @taramilktea, because she has lots of followers. She liked it and posted it and then lots of people started asking about my work. On what gets the most likes on Instagram: Foods which are already popular – like matcha desserts, waffles, burgers, pancakes, donuts, ice cream cones or flat lays – tend to get more likes. Anything decadent like oozing chocolate or molten cheese also works, so adding cute faces or cute toppings will guarantee an inflow of likes. On being 17 and an online star I started making YouTubes about five years ago, then in high school I started more baking videos. There's not a huge kawaii community on YouTube, which is one of the reasons why I think my channel (Kawaii Sweet World) has been so successful. In the past year I was president of community service at the club at our school and I'd bribe people to come to meetings with the leftovers from my videos! On avoiding diabetes Because of my nursing background I'm always looking for healthy alternatives. I've read Harvard papers on sugar levels to see what role it plays in baking. There aren't many sweets that are created where sugar is only a sweet additive; it actually plays a stabilising role. You have to account for that when you're baking. 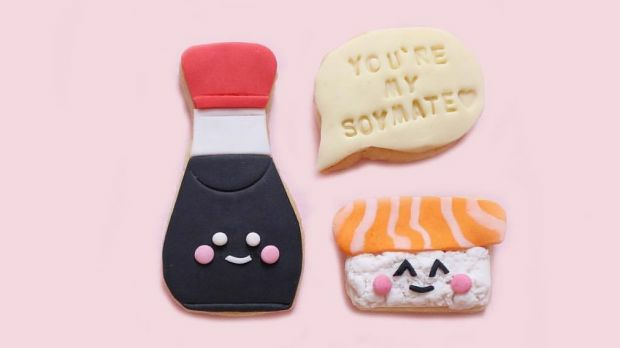 Kawaii cookies by Kerry Tang. Back in 2009, Kerry Tang wanted to bake something different for her boyfriend's birthday. Every year she sets herself the same challenge, but what was a personal project has since morphed into Cuppy & Cake, a kawaii baking business with a serious following. Whether shaped into Pusheen the cat or smiling sushi, she's mastered the craft. All it takes to do the same is her recipe below, practice and a pinch of creativity. 1. Preheat oven to 177C. 2. Combine the flour and baking powder. 3. Cream the sugar and butter. 4. Mix in the egg and extract. 5. Gradually add the flour mixture and beat until just combined. 6. The dough should be crumbly, so knead it with your hands as you scoop it out of the bowl for rolling. 7. Wrap dough in cling film and refrigerate for at least one hour (the firmer it is, the easier it will be to cut). 8. Roll dough on a floured surface so it's about 0.5 to one centimetre thick and cut out shapes using your home-made cookie cutter (see note). 9. Place on parchment-lined baking sheets. 10. Freeze cookies on the baking sheet for five minutes, then bake for 10-12 minutes. The smaller your cookies, the less baking time they require. Keep an eye on them – you're aiming for an even beige colour, not golden brown. 11. Let the cookies sit for a few minutes then transfer to a cooling rack. 12. While cooling, roll out your fondant to 0.1 to 0.3 millimetres in thickness. Cut the fondant into the appropriate shapes using the same cookie cutter you used to shape the biscuits. 13. Dab some water onto the fondant to help fasten it to the cookie and stick down. 14. Add extra details as required, like indents, textures, stamped letters, layers and facial features using an edible marker. Note It's tricky to find a specific kawaii cookie cutter. Instead, print your favourite character or shape on regular A4 paper. Use clear sticky tape to "laminate" the front and back of the picture and then cut out your shape. Place this template onto the rolled-out sugar cookie dough or fondant, then trace around it using a small precision knife or blade. This process can be fiddly but it saves money and helps customise your kawaii cookies.